The entire roster is very small and I’m not even confident we have one guy for every position (although we have the beginnings of a pitching staff), but there is no question that if they ever open a Players/Authors Hall of Fame next to the larger one in Cooperstown, Dirk Hayhurst will be a first ballot electee. And as of today he has two titles to put on his plaque. Out Of My League is now officially published and available in all formats, and without a prescription. The Bullpen Gospels, his startling and unexpected 2010 debut as an author, told the gritty yet funny and redeeming story of a ballplayer’s sudden realizations that a dream career can still turn into a desperately unpleasant job, and that all but about six guys in his minor league were merely there to provide game-like practice for the actual prospects. It became a New York Times best-seller. If you want my detailed unabashed joy at reading the best baseball book since Ball Four, here is my original post from December, 2009. In Out Of My League Dirk’s journey takes him to the majors with the Padres in 2008, and while the experience does not have quite the range of emotions as his first book (that would have required him to produce two baseball versions of Poe’s The Pit And The Pendulum) there are enough laughs and terrors to keep any baseball fan – or just any person – riveted. 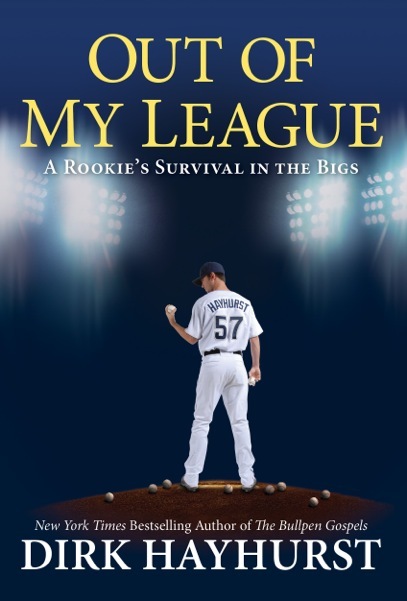 Without scooping his story and telling it as my own, Hayhurst goes – in the span of one baseball season and one book – from moments of absolutely certainty that his career will end with nothing more achieved than the faint afterglow of a Texas League Championship, to being the starting pitcher against the San Francisco Giants. The same kind of disillusionment that made The Bullpen Gospels a universal story of handling the sour taste of reality – and one that you also discover to your shock, not everybody around you is bright enough to perceive – continues in the new book. That this unhappy surprise comes at the major league level makes Out Of My League a touch more heretical, because it dents the fiction that The Bigs are Perfection With Whipped Cream On Top. Just because you’d give your right arm to pitch a game in the majors does not mean that’s a greater sacrifice than giving 20 years of your life for exactly that same singular opportunity. When you think of it in those terms – and Hayhurst forces you to – it suddenly seems less like the childhood dream of fame and success, and more like the scenario in which you get that bicycle you desperately wanted for Christmas, and are promptly directed to spend nearly all of your youth learning how to ride it, with the reward being your opportunity to guide it across a tightrope stretched across the two rims of a bottomless pit. And still it’s a fun read. Plus, it will explain the hesitation of most modern pitchers. Once you read Out Of My League you’ll understand exactly where that uncertainty comes from: The pitcher staring back over his own shoulder is not always just checking a baserunner’s lead.